You need to obtain a student visa if you intend to study for a year or longer. You can be admitted to the school on a tourist visa or a working holiday visa if you intend to study for less than a year. It takes about 6 months to obtain a student visa. A lot of time is required for preparing application documents and for the screening process at the immigration office. Please contact us as early as possible if you need a student visa. 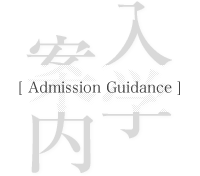 Enter Japan and enroll at the school after obtainment of the visa. The admission process is simple for those who do not require a student visa. We also welcome prospective students who do not need a student visa. For example, it is possible to enroll in a single term program with a tourist visa. Please consult us beforehand.